1. Of the Russian pre-dreadnought battleships Peresvet-class consisting of the Peresvet, Pobeda and Oslyabya, succeeded by the Rostislav and succeeded by the Potemkin. Laid down at the Baltic Yard, St. Petersburg, Russia on 21 November 1895, launched on 18 May 1898, building costs 10.540.000 rubles, commissioned in August 1901, scuttled by her own crew on 7 December 1904 and captured by Japan in January 1905 after Port Arthur fell in Japanese hands. After she was refloated on 29 June 1905 was she renamed as a 1st class coastal defence ship Sagami and commissioned on 20 July 1908 and sold back to Russia in March 1916. After her arrival at Vladivostok on 3 April 1916 was she again named Peresvet. Commissioned as an armoured cruiser. On a distance of around 10 nautical miles north of Port Said were two mines hit laid by the German submarine SM U-73. Heavily damaged broke a fire out and she sunk. 2. 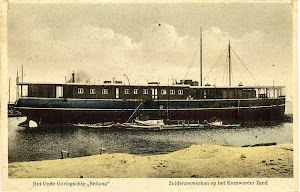 The Jaarboek van de Koninklijke Nederlandsche Zeemacht 1901-1902 reported a visit of Batavia, Dutch East Indies between 26 March-1 April 1902.